It’s the start of tomato season here in North Texas and I just got my first big, juicy, red tomato yesterday. I resisted the temptation to stand there and eat the beautiful red tomato right off the vine and placed it in my basket then picked some fresh basil. I had something very special planned for my first tomato of the season. I was going to make bruschetta for dinner. 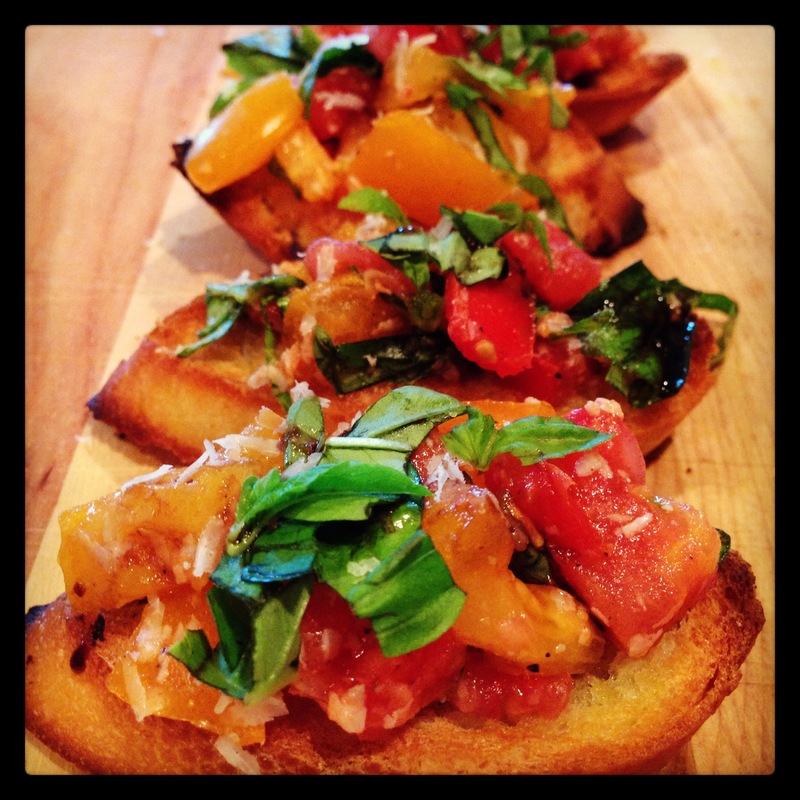 To me bruschetta is the perfect summer meal, juicy red tomatoes right off the vine, fresh sweet basil, salty Parmigiano Reggiano, a hint of garlic and a little drizzle of balsamic vinegar, all served on a piece of toasted French baguette. That’s the taste of summer right there. Since I only had one tomato yesterday I also used a hand full of the little yellow “Sunsugar” tomatoes that I already had. Not only do these little tomatoes taste like candy they are so sweet, but they are also beautiful mixed in with the red tomatoes and the bright green basil. This is a great appetizer to serve for a summer party too! Pre-Heat the broiler in the oven. Dice up the tomatoes and place them in a medium-sized bowl, and with a micro plane grate in half a clove of garlic (save the rest of the clove of garlic). Roughly chop about ¼ cup of fresh basil and add that to the tomatoes and garlic. Add a pinch of salt, a couple of cracks of fresh black pepper, and then give everything a good stir. Set to the side and let all the flavors combine. Thinly slice the baguette on a diagonal about ½ inch thick. Place the baguette slices on a sheet pan and drizzle a little extra virgin olive oil on top of each slice of bread then place under the broiler. When the baguette slices are golden brow flip them over and toast the other side until golden. Once they are toasted on both sides take them out of the oven. While the baguette slices are still hot barely rub each slice of toast with the other half of the clove of garlic. Top the toasts with the tomatoes, basil, and garlic mix then top with fresh grated Parmigiano Reggiano, and drizzle the balsamic vinegar on top.